The Wilson Center is truly grateful for the support from all of our volunteers and ambassadors who help serve our mission each and every day. 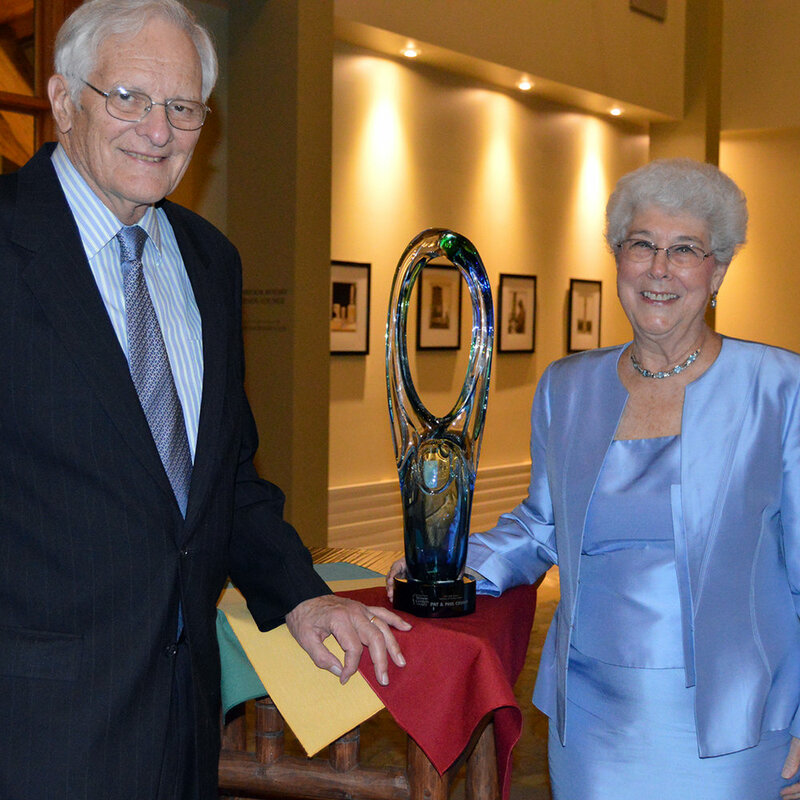 Named for an ardent Greater Milwaukee philanthropist who has dedicated her life to supporting the Wilson Center’s mission, the Kate Wilson Volunteer of the Year Award is awarded annually to an ambassador of the Center who exemplifies community service. In early 1994, following a failed school referendum to build auditoriums at the Brookfield high schools, Pat and Phil Crump joined fellow Greater Milwaukee-area business and community leaders Gary Jorgensen, Nick Owens, Gretchen Henry, and Susan Kurtz at the home of former Mayor Kate Bloomberg. Soon after, The Elmbrook Center for the Arts was incorporated, site visits were made, and the plan put into motion. The current site at Mitchell Park was chosen, and a significant gift was made by Don and Kate Wilson in memory of Don’s first wife Sharon Lynne Wilson. Phil’s volunteer involvement with the Wilson Center started with that meeting at Mayor Bloomberg’s house: he led the steering committee, incorporated the Center, drafted the Articles and By-laws, filed for, and obtained tax-exempt status from the IRS. Phil was the president of the corporation for the first three-and-a-half years overseeing site selection, architect selection, a feasibility study, and adjustments to the project as necessary. Pat’s volunteer work with the Wilson Center started at that same meeting at Kate Bloomberg’s house, and she remains a consistent and dedicated Wilson Center volunteer. Her deep interests in the performing arts, the opera, the theatre, and the visual arts provides endless volunteer opportunities, and her involvement with and knowledge of the arts provides collaboration with arts organizations from the East to the West. Pat’s interest in the visual arts also led her to the Wilson Center's Visual Arts and the Lynn Chappy ArtsPark Committees. Pat and Phil are volunteers, patrons, donors, ambassadors; they have worked on the Center’s capital campaigns and continue to introduce new individuals to the Wilson Center. Pat and Phil are true friends of the Wilson Center and believers that the arts truly do transform lives.